My experiences doing family history in Ireland have generally been frustrating. Our Buchanans and McCallums left Ireland before there were good records kept. My experience with a friend's Peter Evans' family was fun and exciting. Searching on the maiden name of Jane Cromer brought up a flood of information about German clock makers who emigrated to Ireland in the 1800s, including Jane's father, Conrad Cromer. He took over the watch making business of his father-in-law Robert O'Shaughnessy at 18 George Street, Limerick, Ireland. Robert in turn, had continued the fishing tackle business started by his father Daniel O'Shaughnessy, inventor of the famous Shaughnessy or O'Shaughnessy fish hook, still in wide-spread use over 200 years later. Daniel designed the O'Shaughnessy hook, but the metal was brittle and would sometimes break. Robert perfected the metallurgy, allowing his hook-makers to do the heating and tempering on the common Irish turf fire, producing hooks that were better than those produced by his deceased father and deceased elder bother John. An apprentice of John's by the names of Sells also sold O'Shaughnessy-style hooks in competition to Robert. But Robert's main business was watch and clock making. The Limerick museum has one of Roberts tall (grand-father) clocks on display. Some of Conrad Cromer's watches are still in existence and photos can be found on the internet. Robert's children carried on the business after the death of Robert in 1842. Conrad married Jane in 1854, so 12 years later. Conrad's family carried on the business after his death in 1903. I would never have expected to find myself tracing the pedigree of a fish hook, but that is what led me to Daniel and John O'Shaughnessy! I hadn't done indexing for a while and decided to start again. 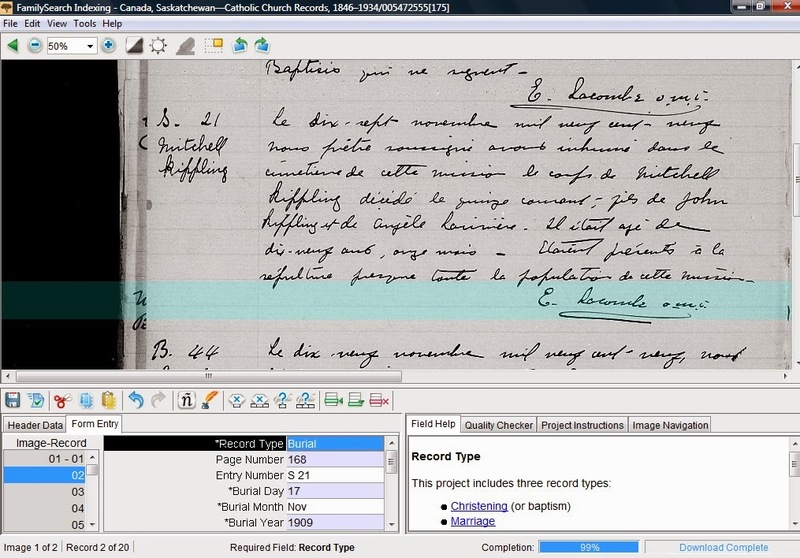 I chose to download a batch of Saskatchewan Catholic records, which were written in French. As a retired French teacher, this seemed like a perfect choice. As I read the name of the priest who recorded these christenings, marriages and burials, I felt a thrill! E Lacombe, OMI. Unless there were two Catholic priests by the name of Lacombe who were members of the Oblate order, this was the legendary Father Lacombe: frontier missionary and peace-maker between hostile Blackfoot, Cree and white inhabitants. He helped persuade the powerful Blackfoot Confederacy to let the CPR build railway tracks through their land. He convinced the Blackfoot Confederacy to stay out of the Northwest Rebellion. He saved hundreds and possibly thousands of lives. They loved him and trusted him and that love and trust was mutual. He was a great man by any measure. As a young priest he was transferred back to the safety and relative obscurity of serving in Quebec, but at the first opportunity he came back to live among the Indian people that he loved so much. By indexing records that he created, I felt privileged to be walking in the footsteps of a man I greatly admire.